As a longtime Nets fan, I’ve had my share of torturous seasons. In fact, I would say I have far more bad Nets memories than good Nets memories at this point. But the one batch of years when I was happy to be a Nets fan, proud to wear my jersey in public and genuinely excited to go to games was when Jason Kidd was the team’s point guard. Kidd, who arrived via trade after domestic violence allegations put the Phoenix Suns in a position where they were looking to dump him–even if it was for the much inferior Stephon Marbury–was, for lack of a better word, a revelation. Kidd could score, but really, that wasn’t what he did best. What he did best, of course, was elevate the play of everybody around him. Whether it was no-look passes, back-door cuts, or perfect ally-oops, there was nothing Kidd couldn’t do to make the team better. 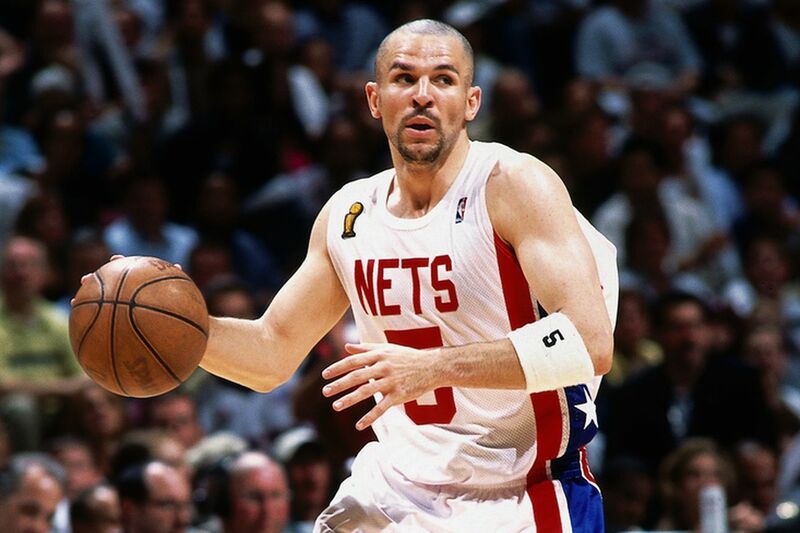 During his tenure as the team’s point guard, Kidd led the Nets to back-to-back NBA finals appearances and the playoffs were an annual certainty. He brought All-Star level play and a competitive fire that hadn’t been seen on the New Jersey-based team before, and hasn’t been seen since. Most of all, though, he brought hope and optimism to a fanbase that desperately needed it. As long as #5 was on the floor, as a Nets fan, you were thrilled because you understood the Nets would always have a chance. You were also excited because you never knew what mind-boggingly amazing pass he was going to deliver next. I hadn’t seen that kind of player–one who simultaneously lifts the energy and the expectations of an entire roster and fanbase simply by the virtue of his presence–since Kidd forced his way out of New Jersey in a trade almost a decade ago. Until a few weeks ago when I watched Aroldis Chapman take the mound in a Yankees’ uniform for the first time. Sure, Chapman’s debut against KC on May 9th wasn’t perfect–he gave up two hits and an earned run–but even in shaking off the rust, you caught a glimpse of what makes him so special. 100 mile-per-hour fastballs were routine; no more uncommon than a Carl Pavano injury or a Lou Piniella tirade. And the two batters he struck out that night? He didn’t just strike them out, he flat out embarrassed them. It was like they never even had a chance. Since then, Chapman has been nearly perfect, tossing six scoreless innings with nine strikeouts and only one batter even reaching base. 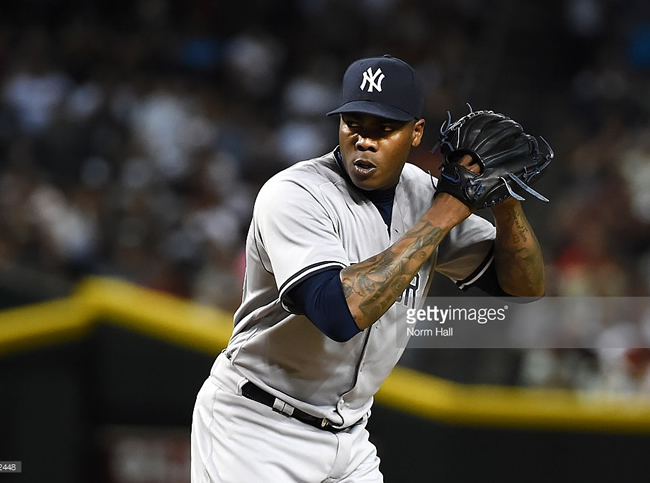 In each of those six appearances, Chapman has slammed the door…..and the windows…..and the gate…..and the latch, resulting in the preservation of six Yankees victories. His overpowering velocity has taken the team’s bullpen, which with Dellin Betances and reigning reliever of the year Andrew Miller was already a strength, and turned it into an unstoppable force. As of this writing, they have won ten out of the fourteen games since Chapman’s thirty-day suspension ended, and he has lifted the spirits of both teammates and fans. Much like the famed 1996 bullpen that boasted Mariano Rivera and John Wetteland, it is now not only desired, but expected that the Yankees win if they are ahead after six innings. Most importantly, though, Chapman has taken a team that was being choked by a combination of boring personalities and aging players on bad contracts, and injected the type of in-game excitement the franchise has lacked for years. Don’t believe me? Go read Billy Witz’s excellent piece on Chapman in last weekend’s New York Times. Longtime fans are quoted saying everything from they feel the life in Yankee Stadium has returned for the first time since the team’s last World Series win in 2009 to being conflicted about wanting the Yankees to win, but not by too much because they don’t want to be robbed of seeing the Cuban-born fireballer pitch in the ninth. Andrew Miller, whom Chapman displaced as closer upon his arrival, understands very well the exhilaration the “Cuban Missile” brings. But it’s not just fans. Dellin Betances, who has been known to throw fairly hard himself, told Witz he was pumped up to watch Chapman and even made a few friendly wagers with teammates about how high he would reach on the radar gun. And how about Joe Girardi, the Yankees’ manager who is usually as excitable as a block of wood? Yes, even HE seemed jazzed about getting to watch Chapman. Watching the Yankees now, I can only describe the experience to something akin to “Waiting for Godot.” I watch hoping that not only will the Yankees win, but that they will do so in a manner that allows me to see Aroldis Chapman pitch. Me: Holy cow, did you see that? That was 101! Friend: And that one was 102! Me: This is incredible. Wait, 99? What’s with that slow crap! Yes, that’s right: Chapman is so dominant, and throws with such force, that anything below 100 mph is now a letdown. He’s had me so enthused that I have even routinely made my girlfriend stop doing whatever she was doing just so she could come watch him close games with me. Chapman is a phenomenon and quite frankly, when he pitches, it is must see TV. As for the team? Their fortunes have turned around of late, with both starting pitching and hitting being vastly improved, leading to wins in four of their last five series. Maybe it is the Chapman effect. For his part, Chapman has overcome the circumstances that led to his trade–just as Jason Kidd did before him. Like Kidd, he has made a team that was practically unwatchable, even when they were winning, interesting again. And like Kidd, many are speculating as to how far the team can go with him and if he will leave given the first opportunity, which for Chapman would be this winter when he becomes a free agent. I don’t know the answer to either of those questions, but I do know this: Aroldis Chapman is a once-in-a-generation talent whose speed of light fastballs make my favorite baseball team more fun and more successful. They may make the World Series or they may miss the playoffs entirely. Chapman may sign a big free agent deal with the Yankees this off-season or he may leave town just as fast as one of his patented 100 plus mph fastballs crosses the plate. But as long as he’s here, I’ll be watching him and rooting for him. And I’ll be enjoying every second of it.